As we all know that kitchen is the stomach of every house and it is the most important area also because it is a place which fulfills the basic need of the family members Food so it should be clean, organized and free from all kind of insects. 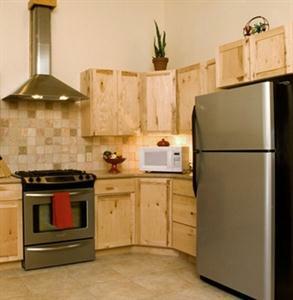 A neat and clean kitchen will keep your family healthier and safer. Kitchen cleaning is very time consuming job and also very tiresome but if you clean your kitchen on daily basis than you can make it really easy for you. But, if you are not able to do that on daily basis than follow the tips and guidelines given below to make your work more easy and less time consuming and keep your kitchen clean from every corner, top to bottom. Kitchen has lots of places and things which need to be clean on regular basis such as sinks, countertops, floors are the important part of kitchen and need to be clean every day. While some other things like cabinets, appliances, chimney, aprons and other things need to be cleaned at least once in a week. How to clean kitchen sink: Every kitchen whether small or large have sink, and it should be one of the cleanest surfaces of home. Sinks come in a wide variety, no matter what type of sink you have it need to be cleaned every day. You can Deep-clean your sink once a week so that it will remain hygiene and free from all kind of germs and bacteria. First of all clean all dirty dishes and left over food from the sink than soak the soft cloth in soap solution to clean the faucets, drain, and outer rim of the sink and thoroughly rinse with the water. 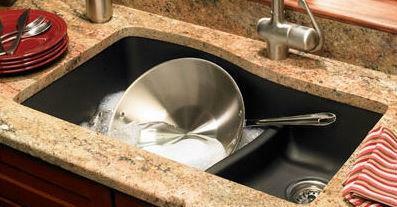 To get a clean sink just repeat the process after every use, this includes after preparing meals or washing dishes. How to clean kitchen floor: It is good to clean the kitchen floor daily to cut down on the build-up of dust and dirt. Mop or vacuum your kitchen floor everyday like you wash the dishes daily. Different flooring material needs different cleaners to clean them. 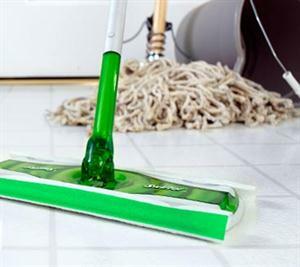 •	To mop up the ceramic tile floors just mix the water with a small amount of liquid dish soap. Do not use scrub pads as they can damage the tile. •	It is good to wipe up spills immediately if you have Natural-stone tile floor as some liquids can be absorbed into the stone very quickly and leave the stain. To clean this type of floor just use damp mop, never use products that contain lemon juice, vinegar, or other acids on marble, limestone, or travertine as ammonia based cleaners can make your flooring dull. • If you have polyurethane finished wood floors than swept it with a soft broom. For mopping just add few drops of dishwashing liquid onto a damp mop, and run the mop along the natural grain of the wood. For Laminate wood floors use laminate floor cleaner only. •	To clean the Linoleum floors scrub it with a nylon scrub brush using the warm soapy water or simply damp mop with a gallon of hot water mixed with 1/2 cup of vinegar for daily cleaning. Tips to clean kitchen countertops: It is very important to clean the kitchen countertops daily, to clean them just mop them with the solution of warm water and a mild liquid dish detergent followed by the dry mop with soft cloth as the moist surfaces encourage bacteria growth. It is good to use nonabrasive cleaners and sponges on all countertops. Wood, concrete, natural stone, and engineered quartz countertops can all be easily cleaned with the above mentioned procedure. Do not clean the countertops with bleach or ammonia. 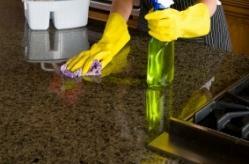 For Glass countertops use nonabrasive glass cleaner. Countertop made up of natural stone such as white Carrara marble or granite can get stains very easily so wipe up spills immediately with a microfiber cloth to avoid staining or etching. Do not use ammonia or anything acidic on natural stone ever. How to clean kitchen Cabinets: Cabinets are very essential part of every kitchen as they provide most of the storage space but need to be clean once in a week as cabinets are the favorite place of insects such as cockroaches and ants to live and breed. Keeping kitchen cabinets clean is easy almost every type of cabinet such as metal, plastic laminate, painted wood, and vinyl cabinets, can be easily cleaned with the help of dish soap liquid and warm water solution followed by the dry rinsing with a clean cloth. 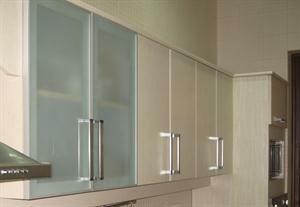 You can also use thinner to get rid of dirt, grit and grease on your cabinets. How to clean kitchen appliances: Kitchen appliances such as food processor (mixer grinder), microwave, refrigerator, cooking stove or range and many more should be cleaned after every use or atleast once in a week. Make a solution of 1/4 cup of baking soda, 1/2 cup of vinegar, and 1 gallon of hot water and fill it in a spray bottle. This solution can remove the grease and grime stains very easily and deodorize your appliances. How to clean kitchen Chimney: Cleaning a kitchen chimney is very tiring and time consuming job. Make sure you know How to take it from the wall and how to dissemble it than only you can clean it otherwise all will become mess up. Clean the filters of the chimney with normal soap solution to clean along with warm water. Clean the internal fans and if your chimney do not have internal fans than you have to clean them within the compartment. How to clean cooking range: Cooking range or gas stove in the kitchen should be cleaned daily after cooking the meal. Just mix the mild soap with warm water and spread over the cooking range for 10-15 minutes. Wipe it with a clean cloth and get stain free cooking range. To clean the Remove any knobs, caps or grates just soak them for sometime in the solution of hot water with soap, scrub them with a sponge and rinse with clean water. 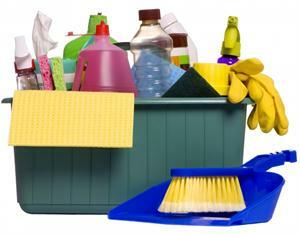 With the above tips and ideas you can make your kitchen clean and hygiene from every corner. Do not forget to clean your kitchen on daily basis so that you can get rid of all kind of impurities and dust from the kitchen.